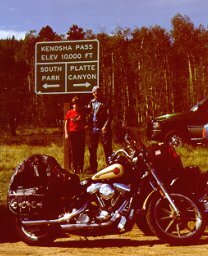 August of 2000 we took a little motorcycle trip over to Crested Butte, Colorado. Kenosha Pass is just outside of Denver on Highway 285. Been over this pass many times, but today the sun was out for a photo. Halfway to Crested Butte is started raining . 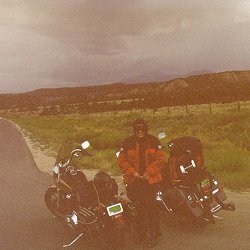 We put on our rain suites just outside of Salida, Colorado. Don't usually put on rain suit until I am already wet. Today I am glad we put it on early, one of the worst rains I have ever been in on the motorcycle. 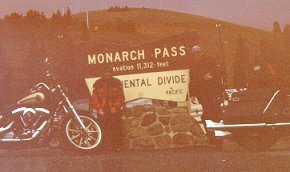 Monarch Pass is located on Highway 50 between Salida and Gunnison. The sun was not out any more this day. 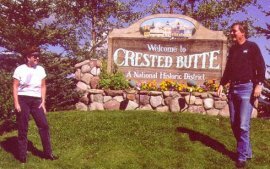 Crested Butte is not to busy in the off season and a nice place to visit. In the summer and during ski season it gets a little crowded. Nice little town!